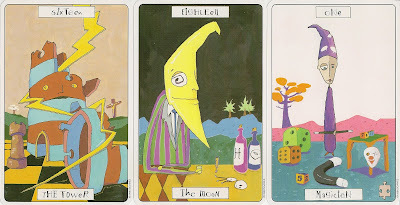 The Major Arcana have traditional names with the exception of the Hierophant, which is called the Grand Master. 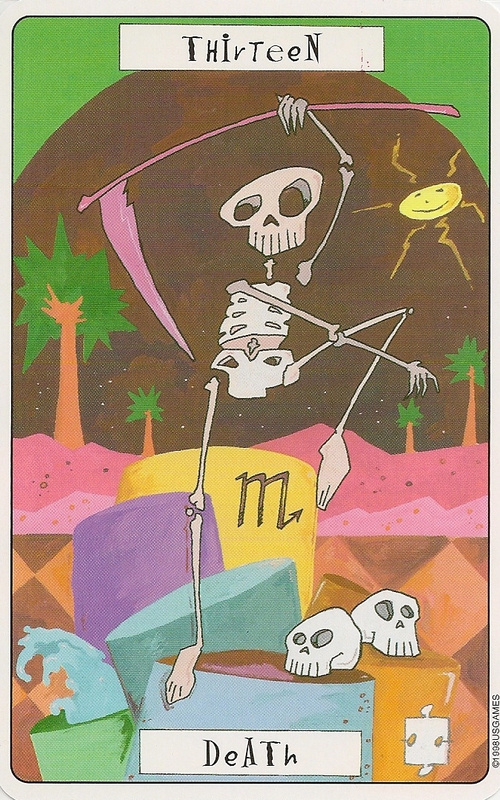 In the Major Arcana the card name number is spelled out in the top border and the name is in the bottom border. 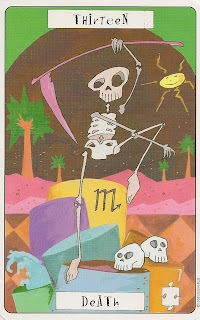 Those Major Arcana associated with a zodiac sign have them worked into the image, but those associated with planets or elements do not. The Majors also have a puzzle piece in the lower right corner that indicates whether the "influence" of the card is masculine, feminine, or both. The suits are Swords, Wands, Cups and Coins. Each suit takes place in a different setting: Swords are in the mind, Wands are at the circus, Cups are in the desert and Coins are in a village. 78 cards, a title card, an informational card ans a LWB, in a standard cardboard tuck box. The cards are oversized ( 13.7 cm x 8.8 cm ).